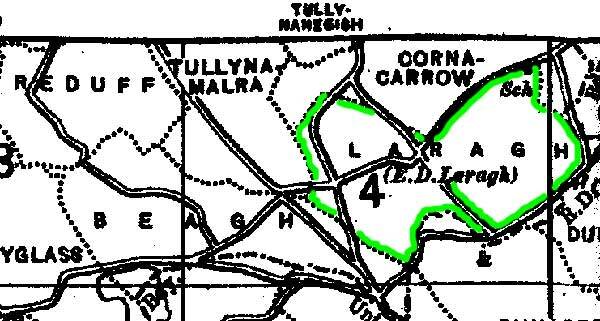 There are several leases involving the OLIVER family and the townlands of Laragh & Creevy. .
One is just south of Ballybay in the Parish of Ballybay. The second is Southeast of the first in the Parish of Aghnamullen. The third is further south in the Parish of Donaghmoyne. I have not included a map of the first Laragh. The second Laragh is the one that concerns us vi-a-vis the deeds. The third Laragh is interesting because of the proximity of OLIVERs. I have included maps for the last two. Updated 2010 Feb 26 - plan of Helen Vale Mills added. Updated November 25, 2016. Two snippets from Griffiths maps included. I am unsure why this map has the North-South orientation going from left to right instead of up and down. It may that was how it was in the document that I copied. (Or else, I was exhausted & made a rather strange copy.) It is part of a deed from December 13, 1775 and relates to two deeds from the 1770s involving the OLIVERs and various land transactions. It makes more sense seen with the Griffiths Valuation Map beneath. 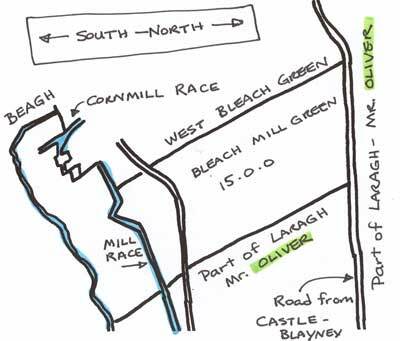 In terms of connections of both geography and ownership of the mills of both Laragh and Cherryvale, it helps to see that they share same millrace, with Cherryvale north of Laragh. 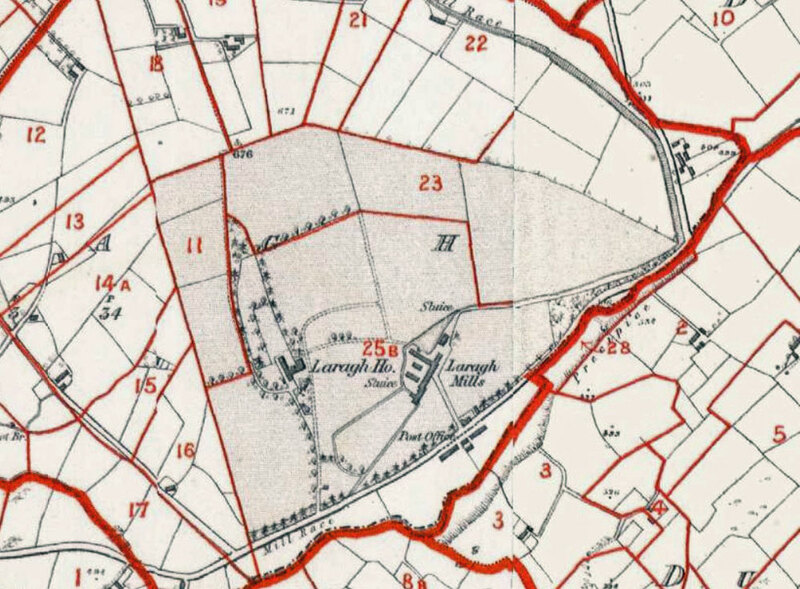 Given the presence of the Townland of Beagh right beside this townland of Laragh - I am guessing that this is the one referred to in the leases. 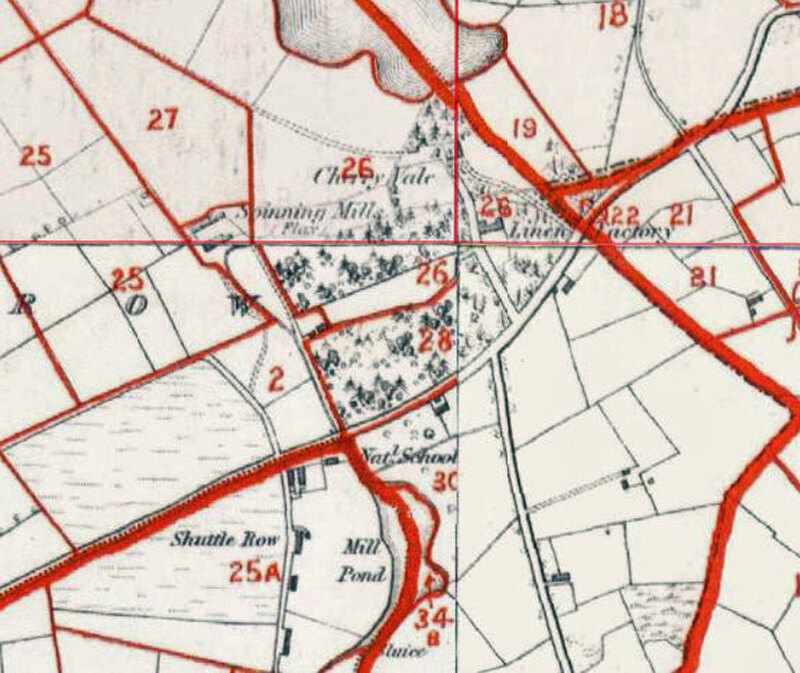 Also, the Townland of Reduff also shows up in connection with the name OLIVER. 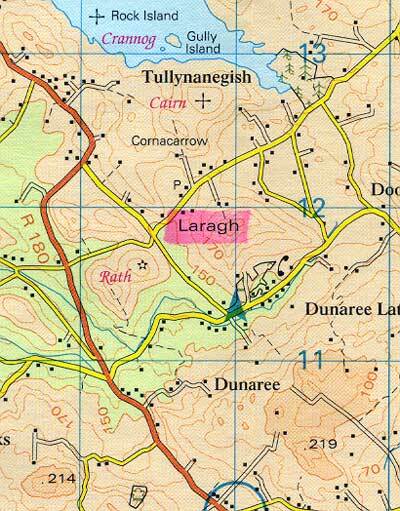 But just to confuse us, there is a second townland called Laragh, southeast of the first one. Creevy, just south of it - which also shows up on OLIVER leases has the name OLIVER beneath it. 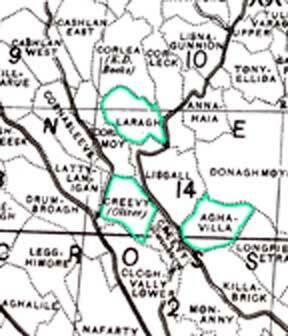 This map shows the relationship of the townlands of Laragh, Creevy and Aghavilla. Going by the river that seems to wend its way to Bocks Lough to the South-West (off the border of this map), I am guessing that the millrace was south of the road to the right of the green triangle. In another version of this map, Laragh House is shown between the road and the river (or stream). The Laragh mills are about equidistant from Ballybay and Urcher - about 6-7 miles away from each. Given that the JACKSONs of Urker and the OLIVERs of Laragh had many relations in common, this is of interest.. 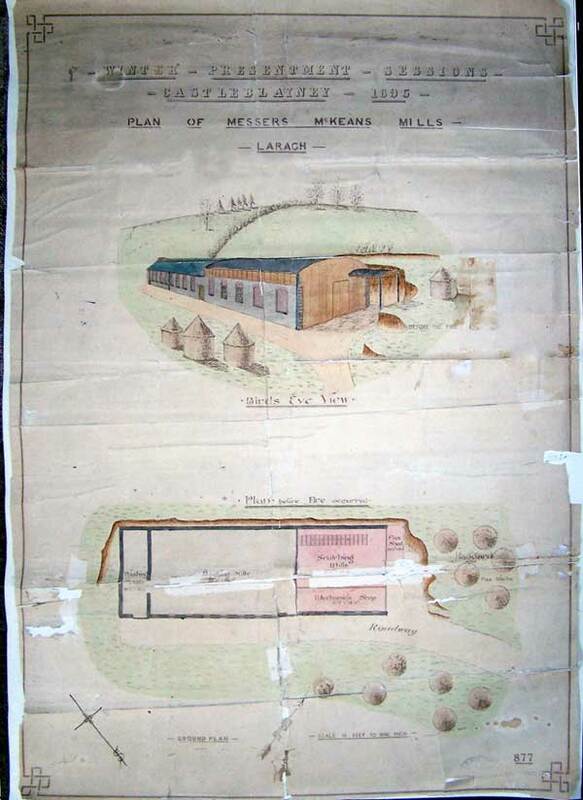 I attach a photograph of a plan of "Helen Vale Mills" dated 1895 which I thought might interest you. The original is approx 28" X 21" and is badly torn, and was edited in Photoshop. Mary Kerley email February 25th, 2010. Thanks also to Michael Burns who originally shared this document with Mary.